"A long, long time ago I can still remember how that music used to make me smile..."
WABC stopped playing music on May 10, 1982 a date known as "the day the music died". The main reason is really quite simple: FM Radio. First, FM stereo sounds better. The same music played on AM vs. FM clearly sounds significantly better on FM. The F.C.C. did not help matters by constantly deferring a decision concerning AM stereo for years and years. But, even if a standard could have been agreed upon for AM stereo, FM still would have had the edge. Musicradio WABC was first and foremost a music station. If the music on WABC did not sound as good as the identical music on another, better sounding station on FM, what chance did it ultimately have? And, of course, FM radios themselves just kept getting better and better. The same FM station in New York City could reliably be listened to 60 miles away on car radios by the end of the seventies. The earlier FM radios simply did not have that kind of sensitivity or selectivity. Of course AM stations did (and still do) have a further reach, but the difference was now insignificant as far as the local radio market was concerned. Second, and I believe this point is frequently overlooked: With the advent of FM stations you introduced another 20 plus radio stations into the market. When AM was by itself, there were simply fewer radio stations. Those fewer stations needed broad appeal formats to survive; whether it be music, talk, or news you had target your format to be generally appealing. Now, what happens when you add more radio stations? You end up with a different kind of programming. Today, radio stations generally do not try to program to everyone. Instead they target a specific demographic group and program to it. So, rather than playing all the hits you pick and choose from that list to fit your demographic. Today, instead of traditional "Top 40", you have Alternative Rock, Classic Rock, Urban Contemporary, Classic Soul, Adult Contemporary, Hot Adult Contemporary, Contemporary Hit Radio, Dance, Oldies and so on. Musicradio WABC tried to reach the audiences of all of this music and successfully did so for many years. But now with so many radio stations, music is fragmented into separate stations each targeting their own small piece of the music audience. 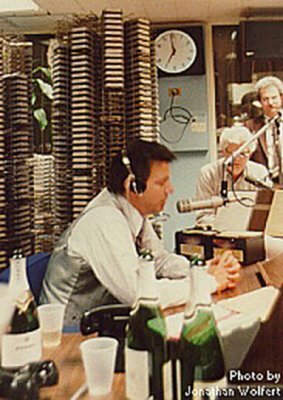 This was the ultimate downfall of all the great AM Top Forty radio stations like WABC (and many others like WLS Chicago, CKLW Windsor/Detroit, KHJ Los Angeles etc.). Was something lost? This is, of course, debatable. In my view, yes. Whenever "we" do things together we have a bond. We all listened to these great Top 40 radio stations in the 50s, 60s and 70s. Ask anyone over the age of 30 if they ever heard of the Beatles, the Four Tops, Elvis Presley, or the Beach Boys and almost everyone can name their hits. Do the same for most any of todays stars and even the 14-25 year olds wont know the stars names from the "other" formats. Of course, the plus side is that you dont have to listen to a lot of music you dont like just to hear the things you do like. That is the basis for todays music radio programming. Yet, a lot of the fun of a station like Musicradio WABC has been lost. Instead of trying to find that magic formula of what will appeal to most of us, we try to find some combination that wont offend only a few of us. In my opinion, thats too bad. Dan Ingram (l) and Ron Lundy 24 seconds after "The Music Died"
I had been a frequent visitor to WABC ever since the 8th grade. But as the guy responsible for making WABC's jingles for many years, it wasn't too difficult for me to get into the station during its last days of music. I was in the studio for Dan Ingram's last "regular" show on Friday 5/7/82. This was important to me, because Dan's show going off the air really symbolized the end of WABC as I (we) had known it. The show began with an almost party atmosphere. I don't think Dan had the faintest idea what he was going to do for "honor group of the day"; he just knew it had to be something significant. So he said "it's a secret" to give himself some time to think. By the time the show was ready to end, he had devised the perfect final words. There was a faint possibility that the format change would not occur as scheduled. There were some union issues having to do with WABC airing programs originating from Los Angeles on the ABC Talkradio network. The negotiations were taking place even as Dan's show aired. If these issues hadn't been worked out, the format change would have been delayed. That's why Dan said something like "this is the last show... well, it may or may not be the last show..."
By the end of the show, studio 8A was as crowded as I've ever seen it, but you could hear a pin drop as Dan delivered his final goodbye. Everyone applauded as Dan's "electric radio theater is OFF the air" jingle played (for the only time ever). But Dan's mike was turned off during the jingle so you don't get that effect on the aircheck. People began to slowly leave the studio. I did have the distinction of being the last person to speak to Dan before he left the room. I said, "thanks for all the days when listening to you was the best thing that happened". I think he liked that. Dan then went outside to clean out his little locker. He found some really old 8x10 publicity photos that must have dated back to the early 60s. He started handing them out to everyone standing around. Most people got theirs autographed. So did I. At this point, Jay Clark (the PD) invited me to join him and a handful of other station staff for a drink at a nearby bar. The conversation centered around what the last song should be, just before noon on Monday May 10. Some argued for an uptempo Beatles song, because it would remind people of the station in its heyday. Others wanted something more somber, such as "American Pie" ("the day the music died" etc.). Another faction wanted a song with a strong lyric message that would represent the WABC generation. As you know, in the end they went with "Imagine" by John Lennon. It was a tribute to Lennon (who had been recently slain), an indirect tribute to the Beatles of which Lennon was a member, and a song with an idealistic message. They took my suggestion about playing the WABC Chime jingle as the very last sound heard. Jay Clark decided on the 5 seconds of silence after the chime, followed by a :60 Talkradio jingle. It turned out that it was a cut I had written the lyrics and music for. I was invited to be at the station for that last Lundy/Ingram show, but I declined. I knew it would be a media circus, and I decided I'd rather hear the show coming come out of a radio just like everyone else. I was at home, on Long Island, hearing WABC end in the same room where I'd heard it years before at its peak. I KNOW that this won't make sense to anyone who didn't live through it, but hearing that station go away really did feel like there had been a death in the family. I've heard this analogy from many people. Later that day, I went to ABC because I had a meeting with Rick Sklar and his staff concerning Superadio (which was still very much alive at that point). I could tell that Rick was having a pretty emotional day too. But, like Lundy & Ingram, he had Superadio to look forward to and that was keeping him going. Someone at ABC had found out that it was my birthday, so the Superadio crew surprised me with a birthday cake. Can you see why that day was such an emotional roller coaster? Listening to the tapes I made of that last weekend of Musicradio (which Allan has posted) brings back all those memories and emotions as if it all happened yesterday. And, to be honest, I still can't listen to some of those moments without feeling a tear or two form in my eyes. Maybe I'm crazy. and Peter Bush does a very good listener participation final music show. 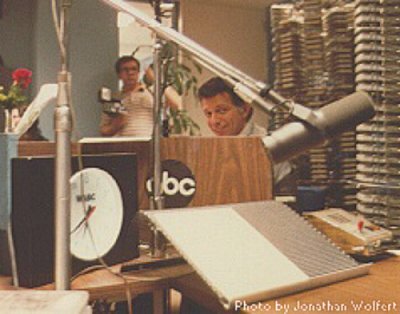 Ron Lundy and Dan Ingram sign off WABC on the final show from May 10, 1982.
and, of course, say goodbye before the final song. The WABC "Chime" strikes for the last time and Talkradio WABC is born. The final music montage played on WABC. A real "blast from the past"
6:40 PM on Friday May 7, 1982. With twenty minutes to go, the mood is still playful but the significance of the moment is starting to sink in. "The honor group of the day is you..." At 6:59 PM on Friday May 7, 1982, Dan Ingram says farewell at the end of his last regular show on WABC. Note the flowers and champagne bottles which fill the studio. The best radio "tribute" that I ever heard about Musicradio WABC was done just after its switch to talk. It was produced by Earl Bailey of WNEW-FM in New York. 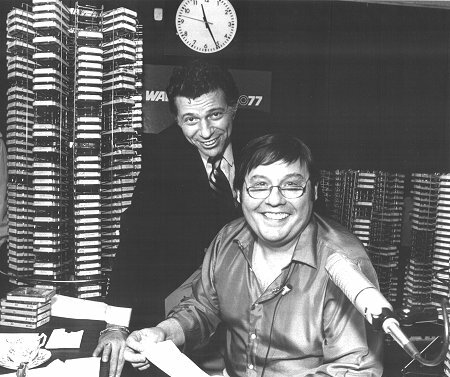 At that time, former WABC air personality Scott Muni was program director at WNEW-FM. Under his guidance and the brilliant job of Earl Bailey, this two hour program covered many of the best parts of Musicradio WABC. It includes interviews with Scott Muni, Herb Oscar Anderson, Cousin Bruce Morrow, Bob Lewis, Chuck Leonard, and WABC program director Rick Sklar. This is the entire show and has not been edited or "scoped" with the exception that the commercials were removed. If there is a single place on this entire web site where you can get a real feel for what WABC was all about, this is that place. It includes airchecks, music, interviews and analysis. It's worth every minute of its almost two hours if you're at all interested in WABC. Part 1: The program begins with the song "Modern Music On My Radio" followed by airchecks, a Rick Sklar interview, the final sign off, phone interviews with fans of the station, and some great music with Dan Ingram doing the disc jockeying. Scott Muni provides some history as to the beginning of "pop" music on WABC and Bruce Morrow explains the "WABC phenomenon". Part 2: Begins with a telephone interview with Herb Oscar Anderson where he talks about his time at WABC and also speaks about why he believed it was a success. More airchecks and music then follow. Scott Muni talks about the incredible success of the "Principal of the Year" contest, Cousin Bruce then talks about general manager Hal Neil purchasing those famous raincoats for the WABC disc jockeys. Scott returns with a description of how the music was chosen at WABC and comments on how narrow the WABC playlist was. Bob "Bob a Loo" Lewis talks about the origination of his "Bob a Loo" theme song from The Eternals. Bob also speaks about his overnight shift, his desire to move to something else, and the format switch to Talkradio. Part 3: Begins with the ENTIRE Four Seasons Cousin Brucie Theme Song! Cousin Bruce then goes on to defend AM radio and laments the loss of "people" radio stations like WABC. The famous "brief showers incident" is featured and Bruce tells a story of how the power of WABC could get them into trouble. A very funny Dan Ingram "laughing" bit follows. The Beatles era at WABC is discussed by Scott Muni and he tells about meeting them at the airport and the insanity of the female spectators. He also speaks about The Beatles at the hotel and how John Lennon could not stay there without wandering around New York disguised as an old lady! The famous aircheck of the ten thousand Beatles fans outside the hotel singing the WABC jingles to their transistor radios is featured. Program director Rick Sklar then tells a very funny story of a teenage girl who inadvertently came face to face with Paul McCartney in an elevator. 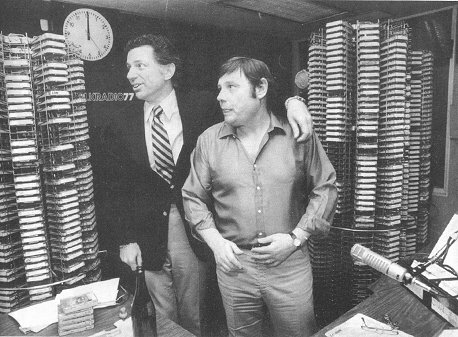 Chuck Leonard talks about getting hired at WABC and then Bob Lewis, Herb Oscar Anderson, Bruce Morrow, Scott Muni and Rick Sklar talk about the reasons for the demise of Musicradio WABC. WABC Musicradio 77 Home Page.